Printable History Timeline Template - put on card stock to use third grade through twelfth grade. This very week you can put together a history timeline template that will help your kids keep track of names, dates, and places - at a glance. And for years. Simply download this timeline, type the dates you want, and print. Then add new dates, tags, and images by hand. Oh! How I wish that I had had a timeline to keep history in order when I was in school. How many of us had an A average in history: yet graduated from college with no "sense of history". The problem is that some history books teach history in scrambled order at least from year to year. Great short cut and study aid for homeschool history and history class at school. Now you can do a full history timeline and and keep the same chart through the years to add new dates and events. It actually becomes a keepsake. For your convenience I'll link to the downloadable timeline several times on this page as I explain some things that have helped us. There's only one timeline on this page. 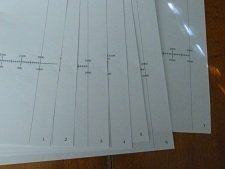 This printable timeline is interactive so you or your students can save it to the computer to edit over time. Great for teachers, parents, grandparents, and tutors. Once you save the download, you can add text in your favorite colors, SIZES, and fonts to add your own names and dates. This means that you can save the changes your files before printing and re-save it to your children or students' files thereby saving ink and paper. The best place to begin studying history and geography is with a timeline to keep the dates in order and to make associations between historical figures and their places in history. The best time to begin using a timeline is at the beginning of the school year. You can add to it through the years, too. I was so excited to learn how to do this and this has been a huge help in our family! Well, actually, it was our daughters who figured how to make this chart. 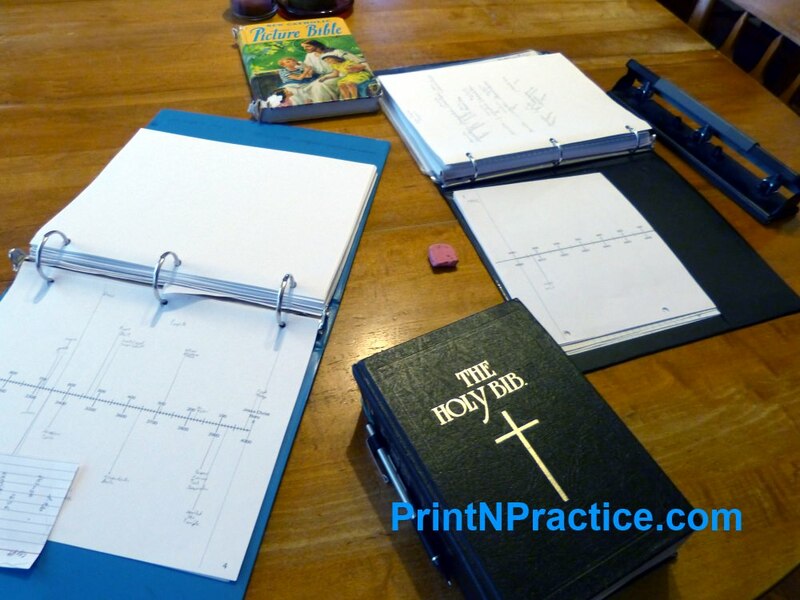 We print our timelines single sided on card stock or sturdy paper; and keep them in our binders through the middle school and high school years, 5th through 12th grade. Another useful time to use a timeline is before tests or finals. Reviewing names and dates is super easy when they're all laid out in one chart which simplifies taking notes of the important events. If you or your children keep your timeline in the computer, whenever you find a new historical person or event that you would like to track, you can add it to your timeline using your keyboard. You can add dates by hand after it's printed. 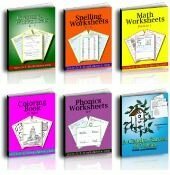 Many school and homeschool curricula teach history in mixed order starting in third grade and continuing through high school: US History, World History, US History, World History, US History, World History. You get the idea. Timelines are the answer for keeping history in chronological order - even if it is studied in scrambled order. Once your kids begin to use a timeline template, history begins to make sense. No matter in which order your curriculum teaches history, your students can understand and remember historical events better if they place events that they study in their proper place on their own timelines. Even if your kids have a good sense of history, they can still benefit by adding names and dates to their timelines. Items of interest from historical books and literature fit nicely in a historical timeline, too. I like to begin with a world timeline and add major dates as the school year progresses. Store the timeline in a binder or spread it out to study. I have learned to have my students print the following timeline template on card stock so that the timeline can endure through the years. Even children as young as third grade enjoy placing dates on a timeline and with care they can do this well. Teach them to write neatly and small. By the time children reach seventh and eighth grade they really appreciate the importance of keeping a timeline. It's a great study guide. Very soon they see how useful it would be to be able to keep it through their high school years, so this is very helpful when teaching homeschool history as we're more able to keep the same supplies through the years. I know other teachers and parents besides myself who received near perfect History scores in high school and college; but didn't have a sense of history until they began teaching history with a timeline. The idea of using a timeline was mentioned or required often during our school years, but we didn't think of keeping the same chart throughout our years in school. Many of my teachers skipped it. Oh, how I wish I'd have thought to save my timelines in those days! I love history. This would have been perfect. A timeline template is an awesome teacher aid, too. 'Just keep it on your desk or handy in your planner. I still add to mine, especially when we've studied a new historical figure or read a new book. This seven page world history timeline template begins with the dates that I found in the back of our family Bible. I used this Bible timeline to find major dates to place in the BC world timeline. Bible timeline template - Use the first several pages. World history timeline template - Print the whole download. American history timeline template - Use Page 6. 1. Start young. I've had third grade children able to handle keeping a timeline well and, on the other hand, I've had sixth grade students not be able to keep track of the difference between Anno Mundi (Year of the World - From the first Creation) and Before Christ (BC - dates go backward in a negative direction) without the timeline; so age is not the important issue as to when to start. I do know this: The older your students, the easier timelines are; but it is so very helpful to younger students, that I'd recommend starting at any time. I sure hope my grandchildren start early. A few dates at a time are not much effort for children to place once their timelines are made or in this case printed. You just have to help a bit more. 2. Print on card stock. This makes the timelines last longer and also makes them easier to find in a stack of mislaid papers. Did we lose one? Did we have to make new ones or reprint? I know from experience that the card stock is easier to find in a pile. You can feel it or you can see it from a distance because it is not rumpled or because it's holding up other pages. 3. Print single sided as this can make using the seven pages less confusing and able to be laid out in a single line almost six feet long. The page numbers in the bottom right corner are very helpful for making sure to have the pages in order, especially in a classroom setting. This is also a huge help for keeping BC and AD dates in order. 4. Punch three holes. Whether or not you intend to keep your timelines in binders, I'd keep the option open and do it early. This way if you want to punch holes later, you won't risk removing completed information. I keep mine in the folder of my binder because I use it frequently. With many additions through the years, I'm glad the holes are already punched. 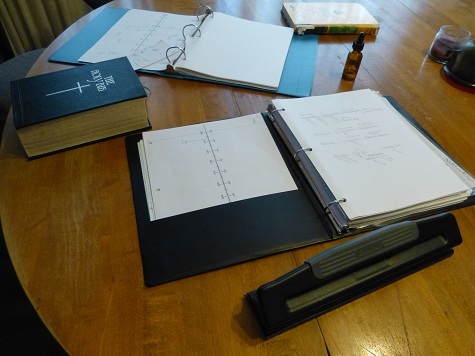 I have seen children use either a binder or a folder. My experience with children shows that it is best that they keep their timelines in their binder. That way it's easy to flip to the right page, too. We usually do not go beyond one thousand years very fast, so the other pages are kept better in a binder even if the one page is loose. 5. Keep through the years. Nothing helps one's sense of history like a timeline and keeping the same timeline all the way through the school years is so helpful for remembering the names and dates in history. It sure would have helped me in high school and college history if I'd had my high school notes on a timeline. Do yourself and your children a big favor. Help them make and keep a nice timeline. Use pencil. I am so glad to have mechanical pencils, especially the finer lead of a .5 Pentel, Pilot, or Zebra. We all make mistakes, especially little children, so I like to have plenty on hand. They save sharpening time and mess and write so neatly. Be sure to get extra lead, too. Rather than be discouraged by an ugly pen mark, pencil marks can be erased. Even through the ten or more years that we've been doing this, the pencil marks remain legible, so using pencil has been very helpful. If you need to preserve a child's work for longer than high school, consider photo copying it as for college. Use manuscript print. 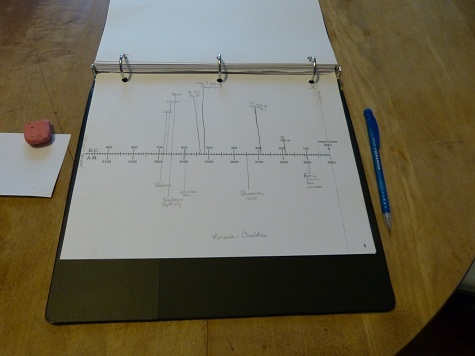 Manuscript handwriting is easier to keep neat on a timeline as with creating maps. As with map making, printing the words can make them easier to read - especially over time. You can also emphasize a title by using ALL CAPS, which is hard to do with cursive writing. Use a ruler. Help your children use a ruler, especially a small ruler for drawing straight lines. Show them how to align with other lines or the edge of the paper to make square lines at 90 degrees to the date line. Keep that ruler clipped into the binder rings if it has holes for it. Tour the class. If you're teaching several children, take a tour around the classroom to check to see that dates are being placed relatively well. On the first day I found it easier to begin with just a few dates such as Creation (page 1), Jesus' Birth, and even the child's own birthday (page 7) especially with kids in third and fourth grade. Depending on your students, these few dates can be enough for a first sitting and is useful in gaining a "sense of history". It anchors the spanse of time involved in studying history, from "the beginning" till "now". It's encouraging to kids to find that "that's all there is", that recorded history really all fits on this chart if you write neatly and well. I remember the days when I taught several different ages of our own children to place dates on their timelines. It was a lot of work for the youngest to make those pages. Printing the basic names and dates was much easier! We all sat at the dining room table with the older children between the younger children. The older children and I helped the younger children place the main dates. 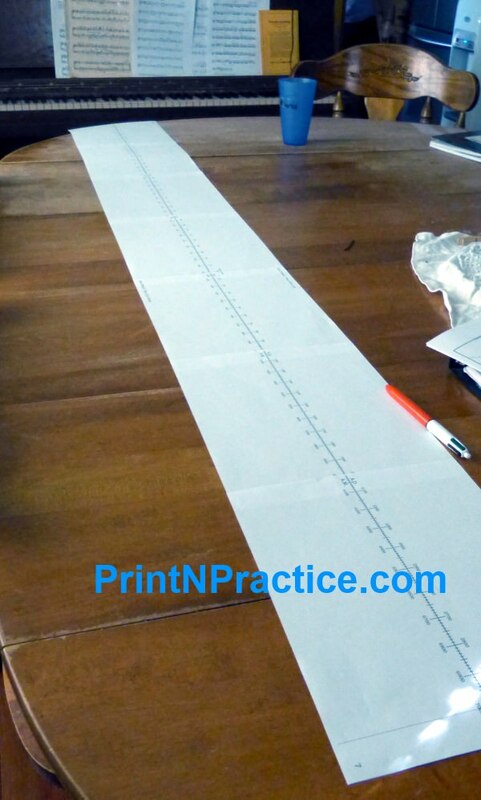 Our older children had drawn their own with ruler and pens, but by the time our youngest children were ready we had printed this printable timeline template. What a huge relief to all of us! The first dates are the trickiest to place. We kept a 3x5 card to use as a ruler. lower case d. for "died" near the date. Although, if you're going to use your timeline through the years, you might want to stick with the birth or death. Some books don't say which or only offer the one and that's why we often have both on our timelines. 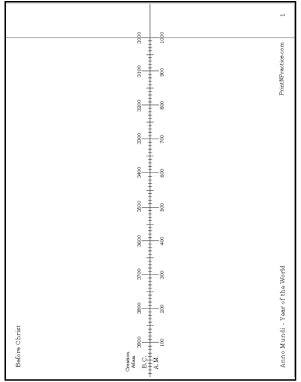 These timeline pages have the tick marks for one thousand years per ten inches on a page. Each tick marks a decade. If the date is marked with the event, birth, or death; it helps the children mark accurate placement of the names. We have fun putting the "good guys" in the top space and "bad guys" in the bottom space under the line. The more we liked them, or the more obviously great the event or person was, the higher we placed them on our chart. The worse they were, the lower they were placed. Use maps of the United States with our history timeline to anchor names, dates, and places together. 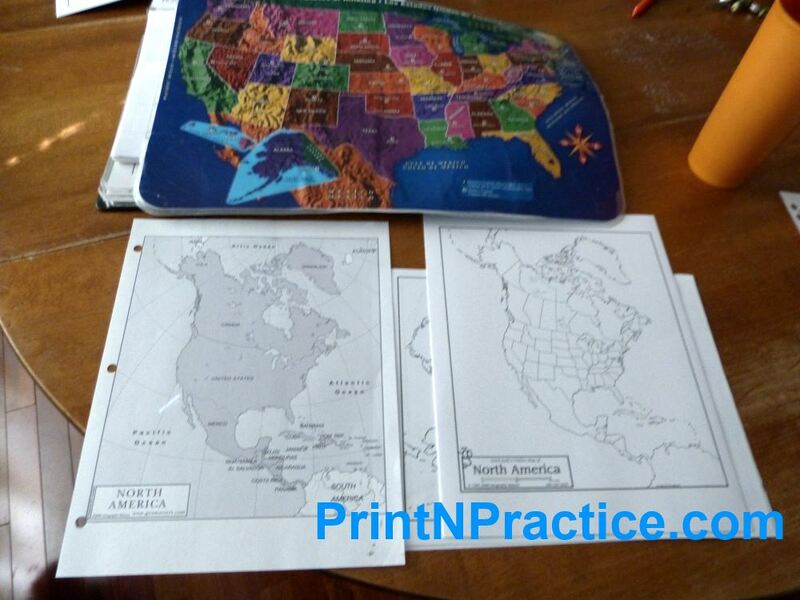 Since history and geography go hand in hand, it's an awesome idea to keep printable world maps in the same binder or folder as your timeline for easy reference. We use The Ultimate Geography and Timeline Guide as it covers vocabulary and the use of geographical maps with history. I printed the maps from Uncle Josh's Outline Map Book (or CD-Rom) on card stock and hole punch to keep in my binder. I keep the current one I'm using loose-leaf so I can refer to it easily. Oh, and so often, history books do not have maps in easy places, so I keep an extra copy in the back of our history book so we can mark it and refer to it as we study. In conclusion I'd like to say that teaching history used to scare me. Not now! It's super interesting and like filling in a puzzle. We find ourselves adding dates even when we're not "studying". At the dinner table: Hm.... "When was that?" "Where did it happen?" "Who did it?" Just like we turn to our globe when talking about world issues, we also turn to our timeline when we're piecing together how events turned or remembering what came first and what happened last. Be patient. The more students you have and the younger they are, the more help they'll need; but there are fewer dates necessary in the early grades and this is a great head start for their future studies in history and geography. Be encouraged. The older your students, the more they'll appreciate the effort. Young or old your students will all appreciate this "break from schoolwork" and they'll learn as they go. Bring history to life and order with this free printable timeline template. Enjoy!